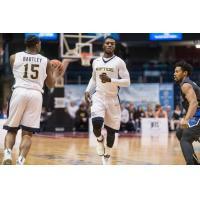 SAINT JOHN - A furious late comeback fell just short Saturday night, as the Saint John Riptide dropped a 99-94 decision to the Kitchener-Waterloo Titans in National Basketball League of Canada action at Harbour Station. Trailing by 12 with five minutes left, Saint John trimmed the lead to two with 40 seconds remaining but could get no closer. "We couldn't get stops and they had us on the run," head coach Nelson Terroba said of the first five minutes of the fourth quarter. "But the guys came back and gave a shot at the end." T.J. Maston scored 26 to lead the Riptide while Frank Bartley added 21. Bryce Washington tallied 16 to go along with 10 boards. Brent Arrington scored 13 and handed out eight assists for Saint John, which fell to 14-20, fourth in the Atlantic Division. Akeem Ellis dropped in 21 for the Titans. Derek Hall and Damon Lynn each scored 16. Kitchener-Waterloo improved to 15-17 with the win, last in the Central Division. The Titans went into the final stanza with a slim 64-63 advantage after leading 35-31 at the half and 21-16 at the end of the first quarter. The Riptide are back in action on Wednesday when they host the Moncton Magic at Harbour Station in a 7 p.m. start. Saint John then travels to St. John's to face the Edge next Friday and Sunday in Newfoundland. The Riptide play their last regular season home game on March 21 when the Island Storm visit Harbour Station.